A spicy twist on the classic dish, and it’s even made in the slow cooker! 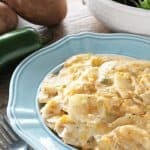 Jalapeno Scalloped Potatoes aren’t your momma’s potatoes. The jalapenos don’t just give it a kick, they also add a whole bunch of flavor. I love making scalloped potatoes in the slow cooker because not only does it free up oven space for other good stuff, it also takes all the worry out of how long it’s going to take for the potatoes to cook through. Set it and forget it and come back to a delicious side dish. When making scalloped potatoes it is incredibly helpful to have a food processor. You can slice the entire 6 pounds of potatoes in about 2 minutes. That’s pretty amazing considering the alternatives of using a mandolin or cutting them by hand with a knife will take far longer. Food processors are incredibly useful so if you don’t have one, I highly recommend getting one. If you’ve watched my YouTube videos or followed my recipes, you know I use it a lot. I personally use a Cuisenart food processor. A spicy twist on the classic dish, and it's even made in the slow cooker! 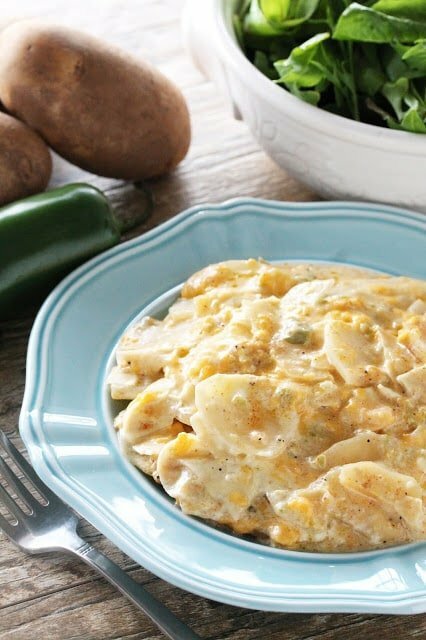 Jalapeno Scalloped Potatoes aren't your momma's potatoes. Slice the potatoes into thin slices. Place them in a large mixing bowl and toss together with jalapenos, Parmesan cheese, chili powder, salt, pepper, garlic, and heavy cream. Pour potatoes into a slow cooker. Cover with lid and cook on high 3-4 hours, or low for 7-8 hours. During the last hour of cooking, sprinkle cheddar cheese over potatoes. Cover and continue cooking for the remaining hour. I was trying to find out were in the instructions to cook it in the oven and for how long. Didn’t seem to find it post here or on your YouTube channel. 350 degrees for 60-90 minutes (depending on how thin or thick your potato slices are). I'll definitely be giving these a try sometime! They look and sound super delicious! my husband would love these! Jalapenos are the best flavoring! YUM! 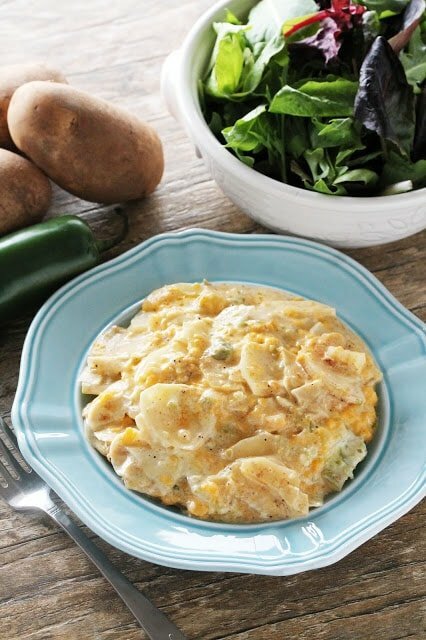 I never thought about making scalloped potatoes in the slow cooker…clearly I need to start! I just got a new slow cooker too…my old one bit the dust recently. I'm going to have to give it a try!